With his colorful tattoos and booming hip-hop sound track, Mike Iaconelli has turned the world of big-money competitive bass fishing upside down. In Fishing on the Edge, Iaconelli tells his own story–and it’s a whopper: a Philly-born, Jersey-bred Yankee who’s been stealing the spotlight from bass fishing’s traditionally all-Southern anglers, attracting fans and dominating one of the fastest-growing sports in America. his success speaks for itself, especially his victory at the 2003 CITGO Bassmaster Classic, the Super Bowl of competitive fishing. Forty-four million Americans fish, but no one does it quite like Mike Iaconelli. In Fishing on the Edge, he lets you in on the secrets to his extraordinary success–how he developed his “power” fishing style, how he attacks the water, positions the boat, and perseveres through those days when the bass just aren’t biting. 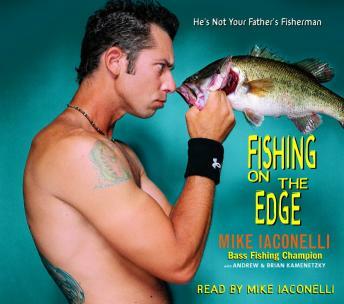 With sidebar tips that can be used by any fisherman–from using spinner baits to picking out the right rod to his no-fail “secret weapons”–this is an intensive, informative, and often raucous journey through the life of a brash young man destined to do for fishing what Tony Hawk did for the X Games: take the sport to a whole new level. At the same time, it’s the compelling first-person story of a man who prepared carefully every step of the way, kept notes on every fish he ever caught, and executed the perfect plan to get to the top. A tale of passion, competition, and extreme personality, Fishing on the Edge is a book for anyone who loves the sport of fishing, wants to turn a hobby into a career, or is simply fascinated by a man’s unstoppable drive to succeed.